The Arkansas Razorbacks football program represents the University of Arkansas, located in Fayetteville, Arkansas, in the sport of American football. The Razorbacks compete in the Football Bowl Subdivision (FBS) of the National Collegiate Athletic Association (NCAA) and the Western Division of the Southeastern Conference (SEC). The program has 13 conference championships, 45 All-Americans, and an all-time record of 700–475–40. The Razorbacks are the 23rd-most successful team in college football history by number of wins. Home games are played at locations near the two largest campuses of the University of Arkansas System: Donald W. Reynolds Razorback Stadium in Fayetteville, and War Memorial Stadium in Little Rock. The Arkansas Razorbacks have 84 active NFL players currently in the 2015 NFL Season. Arkansas prevailed over powerhouses Oklahoma, LSU and Washington of St. Louis in 1909, and was declared unofficial champions of the South and Southwest. It was with the help of Steve Creekmore that this was accomplished. Creekmore became perhaps the first Razorback star, a quarterback from Van Buren who initially played only intramurals. Bezdek used Creekmore to install a very early edition of the hurry-up offense, as the team never huddled and chased the ball after every play. Creekmore was also known for "fast and slippery running, blocking, and passing" and could also return punts and tackle well. There are differing stories about the origins of the 'Razorbacks' mascot, however. The Texarkana Arkansas High School mascot and athletic emblem is the Razorback with red and white serving as the school colors. The Razorback mascot was selected in 1910 to replace the Cardinal as the University of Arkansas mascot. In exchange for its use, the university provided used athletic gear to Texarkana Arkansas High; this practice is no longer used. With the new name and mascot, the Hogs defeated LSU 51–0 and gave Texas A&M their only loss in 1910, but fell short of another perfect season, losing 5–0 to Kansas State. In 1913, Arkansas quarterback J. L. Carter and the Razorbacks lost to Ole Miss, and took a fateful train to Arkadelphia to play Ouachita Baptist. While Carter was eating, he was invited to a meeting of Ouachita boosters. He transferred (which took place immediately, this being permissible at the time) and defeated Arkansas 15–9 in 1914. The Hogs would be contacted by L. Theo Bellmont in 1913 in his attempt to create an intercollegiate conference to regulate use of ringers. Hugo Bezdek, since replaced by E. T. Pickering, had recommended that the Hogs join a conference before he left to coach at Oregon. The Razorbacks joined the Southwest Conference (SWC) as charter members in 1915. The conference also included teams from Texas (Baylor, Rice, Texas, Texas A&M) and Oklahoma (Oklahoma, Oklahoma A&M). Southwestern (TX) would also join, but leave the following year. The 1916, 1917, and 1919 teams were led at quarterback by "Arkansas' greatest athlete" Gene Davidson. The Razorbacks didn't have a winning conference record until 1920, and didn't win the conference championship until 1936. Arkansas had the best record during the 1933 season, but had to forfeit the SWC Championship because Ulysses "Heine" Schleuter, who had no eligibility remaining, played on the team. Schleuter had told coach Fred Thomsen that he was eligible, but he was recognized by an SMU player during the game as a former Cornhusker. The Hogs did accept an invitation to the 1934 Dixie Classic, a precursor to today's Cotton Bowl Classic. 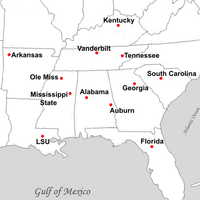 Arkansas became rivals with Ole Miss due to proximity. Although not SWC members, Ole Miss played Arkansas intermittently until a yearly series began from 1952–1961. During the 1938 season, the Razorbacks replaced their 300-seat stadium known as The Hill with Bailey Stadium, named after Arkansas governor Carl Bailey. It was known as University Stadium for one game before being changed to honor the governor. This stadium still exists today, although heavily renovated, as Donald W. Reynolds Razorback Stadium, the current home of the Razorbacks. Arkansas won the conference championship in 1946, earning a bid in the 1947 Cotton Bowl Classic with LSU. The game would become known as the Ice Bowl, as a winter storm hit Dallas before the game. The two rivals battled to a scoreless tie, with Razorback great Clyde Scott tackling an LSU Tiger at the one yardline to preserve the tie on the second-to-last play of the game. LSU would fail to complete the field goal attempt on the next play. The Razorbacks defeated William & Mary the next year in the 1948 Dixie Bowl. In 1954, the Ole Miss rivalry would catch fire. The Hogs played the Rebels in War Memorial Stadium on October 23, 1954. The Rebels were ranked #5 by the AP Poll entering the game, and Arkansas was picked to finish last in the SWC. The contest would be decided by a 66-yard halfback pass from tailback Buddy Bob Benson to blocking back Preston Carpenter, the only score of the game. This is referred to as the Powder River Play, and "perhaps the most important in Arkansas football history to that time" by Orville Henry, a member of the 1954 team. The Hogs would get back to the Cotton Bowl Classic in 1954, only to be defeated by Georgia Tech. Frank Broyles was an assistant under Jacket head coach Bobby Dodd in the game. During this period, Arkansas developed rivalries with Texas and Texas A&M because of the closeness of those campuses. Frank Broyles was hired as head football coach in 1957 and served in that position for 19 years. Arkansas would grow into a national power with Broyles at the helm, including several conference championships and a national title. Arkansas would earn a share of the 1959 SWC Championship, splitting with Texas. Arkansas lost only to #3 Texas and #6 Ole Miss during the season. The Hogs went to Jacksonville and defeated Georgia Tech in the 1960 Gator Bowl 14–7, avenging an earlier Cotton Bowl Classic defeat. Barry Switzer was a co-captain on the team. Some, including University Chancellor and student during 1958, John White, view the Razorback football team during this period as a revival of Arkansas, which was recovering from the Little Rock Nine and racial segregation problems. The 1960s was the best decade in Arkansas football history. ESPN ranked Arkansas the 19th most prestigious program in college football, but if only this decade was included, the Hogs would be 10th. 1960 brought another SWC crown, and a Cotton Bowl Classic invitation for the Hogs, who were ranked as high as 7th during the season. The Razorbacks lost to #2 Ole Miss and #20 Baylor, but defeated #11 Texas in Austin, bringing the championship to Fayetteville. The Hogs lost to Duke, 7–6, because of a blocked extra point. Broyles' team was awarded the 1964 National Championship by the Football Writers Association of America and the Helms Athletic Foundation. The FWAA and HAF awarded their National Championships to Arkansas, who was the only team to go undefeated through the bowl games that year. At the time, the Associated Press (AP) and UPI awarded their national titles before the bowl games, and gave their trophies to the Alabama. The next season, 1965, the Razorbacks were 10–0 in the regular season, and were once again the Southwest Conference Champions. That sent the Razorbacks back to the Cotton Bowl Classic on New Year's Day, this time to play against LSU. Because of the controversy in determining the national champions in 1964, the AP poll would wait until after the bowl games to announce its champion. With top-ranked Michigan State losing in the Rose Bowl, the #2 Razorbacks had a chance to become national champions, but were defeated 14–7 by the Tigers. Arkansas would return to the field in 1966 ranked fifth, but losses against unranked Baylor and Texas Tech would prevent the 8–2 Hogs from playing in a bowl game. Loyd Phillips was a consensus All-American defensive tackle on the team. Phillips also took home the Outland Trophy. After struggling in 1967, the Hogs returned to the postseason in 1968. #9 Arkansas defeated #2 Georgia in the Sugar Bowl, 16–2. Sophomore receiver Chuck Dicus scored the only touchdown of the game for the Razorbacks. In 1969, the Razorbacks had another chance to claim the national title, when #2 Arkansas played the #1 Texas Longhorns, coached by Darrell Royal, at Razorback Stadium in Fayetteville, Arkansas. The game, known as "The Big Shootout" or the Game of the Century, is perhaps the most notable football game in Razorbacks history. 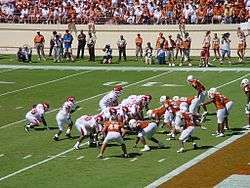 Arkansas led 14–0 at after three quarters, but Texas stormed back and took a 15–14 lead on a two-point conversion, after a questionable passing play was called late in the game by then coach Frank Broyles, which was intercepted by Texas. President Richard Nixon was in attendance, and proclaimed Texas the national champions, even though they had a bowl game to play, and Penn State was also undefeated. Arkansas lost to Ole Miss in the Sugar Bowl, 27–22, and Texas beat Notre Dame in the Cotton Bowl Classic for the national title. The 1970s brought more success for Broyles, led by Razorback standouts Chuck Dicus and Ben Cowins. The 1970 Razorbacks would go 9–2, with the nine consecutive wins bookended by losses in the opener to #10 Stanford and the finale to #1 Texas. The 1971 Razorbacks went 8–3–1, including upset wins over #7 Cal and #10 Texas. They were invited to the Liberty Bowl, but lost to #9 Tennessee 14–13. The 1972–1974 seasons would be mediocre, as Arkansas struggled to defeat the Texas teams. The Hogs went 11–8–2 against schools in Texas, but failed to beat the University of Texas during the span. The highlight of the period was an upset of #5 USC in War Memorial Stadium. Broyles would win his seventh and final Southwest Conference championship in 1975. The contest with Texas A&M was moved until the end of the year, as it was expected to decide the Southwest Conference championship. The Razorbacks did not disappoint, as Arkansas defeated #2 Texas A&M, 31–6, in War Memorial Stadium. The win forced the Aggies to share the conference championship with Texas and Arkansas. However, the tie-breaker went to Arkansas, thus Arkansas received the invitation to the Cotton Bowl Classic. The Cotton Bowl Classic berth would also be Broyles' last appearance. Arkansas would fall behind Georgia early on in that game, but came roaring back to beat the Bulldogs easily, 31–10. Arkansas finished ranked #7 in the AP and #6 in the UPI that season. Broyles coached the Razorbacks in 1976, but with limited success before Lou Holtz took over the head coaching position for 1977. Holtz was elected to the College Football Hall of Fame on May 1, 2008. 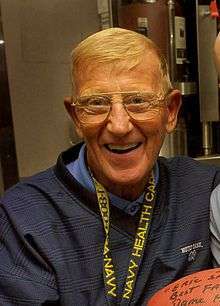 After Broyles left coaching and became athletic director at Arkansas, he hired Lou Holtz to take his former position. Holtz served as head football coach from 1977 through the 1983 season. Holtz led the Razorbacks through a 10–1 regular season, losing only to #2 Texas. The #6 Hogs were invited to play in the Orange Bowl against #2 Oklahoma. The Sooners had a chance to become national champions with a win over the shorthanded Razorbacks, who had suffered a season-long rash of injuries and player suspensions. Prior to Christmas, the University announced that star running back Ben Cowins, leading receiver Donny Bobo, and back-up running back Michael Forrest would all be sent back to Fayetteville. Following the suspensions, numerous African-American players on the team threatened to boycott the game. The always-quotable Holtz said two days before the game, "I'm one step short of suicide". The Razorbacks found an unlikely hero in Roland Sales, who rushed for 205 yards on 23 carries and two scores. Sales also led the Hogs in receiving in the contest. In addition, Holtz used 3rd string running back Randy Richey, who added 98 rushing yards and a touchdown on only 5 carries. The Hogs ended the Sooners' hope with a 31–6 victory. This game is notable as one of the biggest upsets in Razorback football history. Ironically, University of Arkansas alumnus Barry Switzer coached the Sooners in the contest, and late in the game, future Arkansas head coach Houston Nutt played quarterback for Holtz. In 1978, the Razorbacks went 9–2 during the regular season, losing back-to-back games at #8 Texas and #11 Houston. A 49–7 win over #16 Texas A&M did give the Hogs a Fiesta Bowl berth, but the Razorbacks and UCLA Bruins would battle to a 10–10 tie. In 1979, Holtz's Razorbacks won a share of the Southwest Conference (sharing with Houston). The 10–2 Hogs defeated nemesis #2 Texas in Little Rock, but lost an outright conference title to #6 Houston in Fayetteville. Earning a bid to the Sugar Bowl, the #6 Hogs were set to play #2 Alabama with a chance at the national championship. Instead, Alabama defeated the Razorbacks 24–9, winning their sixth claimed national title. The Razorbacks would continue to succeed under Holtz, winning the 1980 Hall of Fame Classic following 1980 and defeating the #1 Texas Longhorns 42–11 in 1981. Despite winning another bowl game in 1982, a 6–5 season in 1983 would be the end of the Holtz era. At the time, athletic director Frank Broyles stated that Holtz had resigned and was not fired, but two decades later Broyles acknowledged that Holtz was indeed fired because his actions were negatively affecting the fan base. Holtz left the program with a mark of 60–21–2. His teams reached six consecutive bowls (1977–1983), but only won one split conference championship. Holtz used a very conservative option offense. Hatfield's resignation left Broyles in a desperate situation. There was not enough time to find a high-profile replacement, and National Signing Day was only three weeks away. Offensive coordinator Jack Crowe was due to follow Hatfield to take the same position at Clemson, but Broyles talked him into remaining in Fayetteville as head coach. The Razorbacks slumped to 3–8 in 1990, and barely qualified for a bowl in 1991. Following a loss to The Citadel in the 1992 season opener, Broyles fired Crowe and named defensive coordinator Joe Kines interim coach for the rest of the season. Danny Ford, who was replaced by Hatfield at Clemson in 1990, took over in 1993. Ford led the Razorbacks to the SEC West title in 1995, but that was one of only two winning seasons in his tenure. On December 10, 1997, Houston Nutt was hired by the University of Arkansas to succeed Danny Ford. In his first year, the Arkansas Razorbacks were 9–3 and won a share of the SEC Western division title. The Razorbacks received their first-ever invitation to the Citrus Bowl where they lost to the University of Michigan Wolverines, ending the season ranked 16th. During this season, Nutt was selected as the Football News' National Coach of the Year. Nutt resigned during a press conference at Arkansas on November 26, 2007, three days after the Razorbacks defeated the #1 LSU Tigers 50–48 in three overtimes. Over the course of his 10 seasons coaching the Arkansas Razorbacks, Nutt compiled a record of 75–48 and his teams went to bowls 8 out of the 10 seasons. His teams were first in the SEC West 3 times: in 1998 (shared with Mississippi State), 2002 (shared with LSU & Auburn), and 2006 (outright). The Hogs played in the SEC Championship Game at the Georgia Dome in Atlanta in 2002 and 2006. 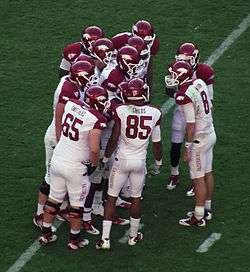 Quarterback Tyler Wilson (#8) and the Razorback offense huddle against Alabama in 2011. After Nutt's departure, Bobby Petrino came to Arkansas from the Atlanta Falcons to become head coach. The 2008 season was expected to be a transition year for the team and Petrino. Though eliminated from bowl contention, Petrino led the Razorbacks to a last-second victory over rival and defending national champions LSU to finish the season 5–7 and a conference mark of 2–6. His 2009 Razorbacks made dramatic improvement. Led by Michigan transfer Ryan Mallett at quarterback, the Razorbacks nearly defeated the Tim Tebow-led Florida Gators, who were ranked #1 in the country at that time, in Gainesville. The Hogs went on to win the 2010 Liberty Bowl against East Carolina and finish with a record of 8–5. 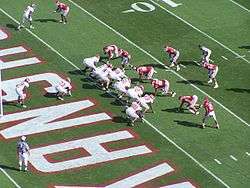 The 2010 Arkansas Razorbacks improved on their 2009 record and won 6 in a row to end the year after earlier losses to Alabama and Auburn. Arkansas finished the season 10–2 overall and earned a BCS bowl berth, the first in Arkansas history. The Razorbacks lost the Sugar Bowl in New Orleans against the sixth ranked Ohio State Buckeyes by a score of 31–26. Though the result was later vacated by the NCAA as a result of sanctions against Ohio State, the game was the first game ever played between the two teams. Under Petrino's tutelage, quarterback Ryan Mallett broke numerous school passing records in 2010 as well. In 2011, the reins were handed to Tyler Wilson after Mallett went to the NFL. Wilson picked up where Mallett left off, and Arkansas spent more than half the season ranked in the top ten. After beating Kansas State in the Cotton Bowl Classic by a score of 29–16, the Razorbacks finished with an 11–2 record and a #5 final ranking in the AP poll, the school's highest ranking since 1977. The eleven wins also tied a school record. The only two teams to beat the Hogs that year were Bama and LSU, the two teams that played each other for the national championship. On April 1, 2012, Petrino was involved in a single-vehicle motorcycle crash in rural Madison County, near Crosses. After initially stating publicly that he was alone, both in a written press release and during a press conference, it was discovered in the police report of the accident that Petrino had been riding with a passenger, former Arkansas All-SEC volleyball player Jessica Dorrell. In his acknowledgement of the report, Petrino admitted to having engaged in a "previous inappropriate relationship" with Ms. Dorrell. As a result of this information, Athletic Director Jeff Long placed Petrino on paid administrative leave, pending an investigation. On April 10, 2012, after his investigation, Long announced that he had fired Petrino with cause, saying that Petrino "engaged in a pattern of misleading and manipulative behavior designed to deceive me and members of the athletic staff, both before and after the motorcycle accident." He also revealed that in addition to his previously-undisclosed personal relationship, Petrino had secretly paid Ms. Dorrell $20,000 and had used his influence to ensure that she was selected from an applicant pool of 159 people for a position on the football coaching staff. On April 23, 2012, thirteen days after Petrino's firing, John L. Smith was announced as Arkansas' head football coach. Smith was signed to a 10-month contract worth $850,000. His hiring was met both with approval and some controversy. A significant number of current players expressed their strong approval for the Smith hire. Some critics, however, argued that he had abandoned his previous post at Weber State after only 4 1/2 months and that he was merely "leasing himself to the Razorbacks for a year." The Razorbacks struggled to a 4–8 record in 2012 despite starting the season with high expectations and being ranked in the Top 10 nationally. Smith was not retained after the season. On December 4, 2012, it was announced that Bret Bielema would leave the Wisconsin Badgers to become the head coach of the Razorbacks for the 2013 season. The Razorbacks started the season with a 34–14 win over the Louisiana–Lafayette Ragin' Cajuns at Donald W. Reynolds Razorback Stadium. This was followed by wins over the Samford Bulldogs and Southern Miss at War Memorial Stadium and Donald W. Reynolds Razorback Stadium, respectively. Arkansas then lost to Rutgers and were 3–1 going into conference play. Arkansas lost all 8 conference games to finish the season 3–9. It was the first time that Arkansas had been winless in the SEC since they joined the conference in 1992 and their first winless in-conference season since 1942, when they were a member of the Southwest Conference. The 2014 season was brighter, with the Hogs winning all 4 non-conference games, but finishing 2–6 in the SEC (6–6 overall), though all 8 opponents were ranked in the Top 25 and the two wins were back-to-back shut out wins over ranked teams LSU and Ole Miss. The Razorbacks were only outscored by a margin of 12 points in conference play. They ended the 2014 season with a record of 7–6 after beating the Texas Longhorns in the Advocare V100 Texas Bowl (31–7). † denotes Interim Head Coach. Source: "Razorback Football Coaching History". Arkansas Razorbacks Sports Network. Retrieved 2008-01-11. In 2002, the rivalry gained some momentum as the game winner would represent the Western Division in the SEC Championship Game. The game (called "Miracle on Markham") was won by Arkansas on a last second touchdown pass by Matt Jones. In 2006, the Tigers snapped the SEC West champion Razorbacks' 10-game winning streak when they beat Arkansas in Little Rock, 31-26. In 2007, Arkansas stunned top-ranked LSU in triple overtime, 50–48, giving them their first win in Baton Rouge since 1993, and their first victory over a top-ranked team since beating Texas in 1981, winning back the Golden Boot trophy (after 4 consecutive seasons in the hands of LSU) in the process. In 2008, the Razorbacks defended the trophy, winning 31–30 on a last minute touchdown drive. LSU currently leads the series 38–22–2. Though the Arkansas-Texas game has not been regularly played since Arkansas's departure from the Southwest Conference in 1991, the Longhorns are still considered by many to be the Razorbacks' top rival. There are several reasons for this, including the result of the 1969 Game of the Century (also known as "The Big Shootout"), which eventually led to the Longhorns' 1969 national championship. The Longhorns won the meeting in 2008, 52–10. The Razorbacks and Longhorns revived the rivalry in the 2014 Texas Bowl with Arkansas earning a 31–7 victory, also giving Coach Bret Bielema his first bowl win at Arkansas. The Razorbacks first played the Texas A&M Aggies in 1903. From 1934–1991, the two had played annually as Southwest Conference members. However, the series ceased in 1991 when Arkansas left the SWC to join the Southeastern Conference. Arkansas leads the all-time 41–28–3. On March 10, 2008, officials from both schools announced the revival of the series beginning on October 3, 2009. The game was played in Cowboys Stadium, and was won by Arkansas. 47–19. The initial agreement between the two schools allowed the game to be played for at least 10 years, followed by 5 consecutive, 4-year rollover options, allowing the game to be played for a total of 30 consecutive seasons. Following A&M's move to the SEC, the 2012 game was played at Kyle Field, and the 2013 game was played at Arkansas, and thereafter resumed at AT&T Stadium in Arlington, Texas. The Razorbacks have always worn cardinal red jerseys. The team wore red helmets with players' numbers on the side through 1963, and in 1964 the first helmets with an early version of the razorback logo appeared. 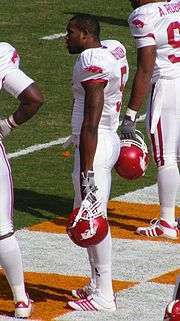 Throughout the team's history, Arkansas has typically worn red jerseys with white pants at home and white jerseys with white pants on the road. However, red pants were introduced on an occasional basis during the Lou Holtz era, and have been an alternate off and on for several years. From 1998 to 2002, and then again in 2004, red pants were the standard on the road while white pants were worn as an alternate. Wearing red pants at home, which some fans consider a curse, happened so infrequently that many forgot it was possible. The Razorbacks wore all red in 2000, but did not wear them again until 2008 in the Cotton Bowl Classic. However, when coach Bobby Petrino took the reins, he developed an entirely different uniform, and the Hogs came out for the season opener in all red. This marked the first time for all red to be worn in consecutive games and also the first time that red pants were worn with a white stripe. It is unknown how many alternate jerseys may have been designed. However, since the end of the Petrino era, the uniforms have been changed to a new Nike outfit, with two full variations of a new Cardinal and White-out, as well as a standalone throw-back of the 1964 era uniforms. A name in bold indicates the team who was winner of that bowl. Arkansas has won 13 Southwest Conference championships. Arkansas has made 3 appearances in the SEC Championship Game as winner of the SEC Western Division but are 0–3 in those appearances. Arkansas was also the SEC Western Division co-champions in 1998 with Mississippi State but lost to the Bulldogs during the regular season, resulting in Mississippi State representing the West in the SEC Championship Game. In 2002, Alabama had the best conference record in the West with a 6–2 mark, but was on probation by the NCAA and was barred from post season play. Arkansas played in the SEC Championship Game due to winning the tiebreaker for a three-way tie with Auburn and LSU, both of whom Arkansas defeated during the regular season. The Razorbacks are 6–13–2 in New Year's Six bowl games (Rose, Peach, Cotton, Fiesta, Sugar, Orange). The bowl they have won the most is the Cotton Bowl Classic, with a 4–7–1 record. Every year, players are selected by several publications to be placed on their All-American team for that season. The NCAA officially recognizes five All-American lists which include AP, American Football Coaches Association (AFCA), Football Writers Association of America (FWAA), Sporting News (TSN), and the Walter Camp Football Foundation (WCFF). A consensus All-American is determined using a point system; three points if the player was selected for the first team, two points for the second team, and one point for the third team. Arkansas has had 47 All-Americans (24 consensus) in its history. * denotes Consensus All-Americans. Source: "History, Honors and Letterman" (PDF). Hogwired. Retrieved 2008-01-12. ↑ "University of Arkansas Season-by-Season Result" (PDF). University of Arkansas. Retrieved December 4, 2013. ↑ "Official Colors". Style Guides and Logos–University Relations. University of Arkansas. 2015-09-27. Retrieved 2015-09-27. 1 2 3 4 5 6 7 Henry, Orville, and Jim Bailey. The Razorbacks: A Story of Arkansas Football. Fayetteville: University of Arkansas Press, 1996. ↑ "Arkansas Razorback Football " Yearly Results, 1910 – 1919." Site. Retrieved on January 31, 2009. ↑ Georgia Tech, 14, Arkansas 6. "Archived copy" (PDF). Archived from the original (PDF) on February 5, 2009. Retrieved 2009-01-16. Retrieved on January 15, 2009. ↑ 1954 Arkansas Razorbacks Varsity Football Roster. Photo. Retrieved on January 15, 2009. 1 2 Forde, Pat. "Legendary Arkansas icon's run nears finish line." May 31, 2007.ESPN. Retrieved on February 4, 2009. 1 2 Fallica, Chris, Loucks, Nick, and Shelton, Harold. "Prestige Rankings: Nos. 16–20." ESPN.com Retrieved on February 4, 2009. ↑ Final AP Top 20. 1960 AP Poll. Infoplease.com. Retrieved on February 4, 2009. ↑ Major Conference Champions. 1960 SWC Champions. Infoplease.com. Retrieved on February 4, 2009. ↑ Bowl Games with Top 20 Teams. 1960 Bowl Results. Infoplease.com. Retrieved on February 4, 2009. ↑ Major Conference Champions. 1961 SWC Co-Champions. Infoplease.com. Retrieved on February 4, 2009. ↑ Bowl Games with Top 20 Teams. 1961 Bowl Results. Infoplease.com. Retrieved on February 4, 2009. 1 2 "All-Time Grantland Rice Trophy Winners". Football Writers Association of America. Retrieved 2007-12-31. 1 2 Kirlin, Bob. "Helms Athletic Foundation/Bill Schroeder National Champions of College Football 1883–1982". Retrieved 2007-12-31. ↑ Kirlin, Bob. "Coaches' polls (UPI 1950–1990, CNN/USA Today 1991–present)". Archived from the original on January 5, 2008. Retrieved 2007-12-31. 1 2 3 "Arkansas Razorbacks – History". Archived from the original on January 1, 2008. Retrieved 2008-01-13. ↑ "1966 Consensus All-America Team." infoplease.com. 1966 All-Americans. Retrieved 2009-10-04. ↑ "Outland Trophy." FWAA.List of All-time winners. Retrieved 2009-10-04. ↑ "1969 National Champions". MackBrown-TexasFootball. Retrieved 2008-01-13. ↑ "1971 Bowl Games with Top-20 Teams." infoplease.com. 1971 Bowl Games. Retrieved 2009-10-04. ↑ "Orange Bowl 1978." Article. Retrieved on January 3, 2010. 1 2 Looney, Douglas S. "At Last, Lou Holtz Has The Last Laugh." January 9, 1978. Sports Illustrated.SI Archives. Retrieved on January 3, 2010. ↑ Helsley, John. "Houston Nutt still wears Cowboy roots." The Oklahoman. December 24, 2009. Article. Retrieved January 3, 2010. ↑ "Fiesta Bowl." Game Recap. Archived January 6, 2009, at the Wayback Machine. Retrieved January 3, 2010. ↑ "Broyles Says Holtz Tired, Burned Out—and Has Resigned." December 19, 1983. Los Angeles Times. Retrieved on January 3, 2010. ↑ "Coach Ken Hatfield." Summary. Retrieved on January 3, 2010. 1 2 Murphy, Austin. Not exactly Hog Heaven. Sports Illustrated, September 21, 1992. ↑ "A Look Back at the Southwest Conference." Article. Retrieved on January 3, 2010. ↑ "Arkansas Coach Quits After Loss To The Citadel." September 7, 1992. Article. Retrieved on January 3, 2010. 1 2 3 "Houston Nutt Steps Down as Razorback Football Coach". Hogwired. 2007-11-26. Retrieved 2008-01-27. ↑ "Ark. puts Bobby Petrino on leave". ESPN. April 5, 2012. Retrieved April 12, 2012. ↑ "Ark. Puts Petrino On Paid Leave Following Crash". KHBS. April 5, 2012. Retrieved April 5, 2012. ↑ "Arkansas fires Bobby Petrino". ESPN. April 10, 2012. Retrieved April 10, 2012. ↑ Joe Schad (April 23, 2012). "Arkansas rehires John L. Smith". ESPN. Retrieved April 23, 2012. ↑ Jason Kirk (April 23, 2012). "John L. Smith To Arkansas, And Razorbacks Players Approve". SB Nation.com. Vox Media, Inc. Retrieved April 23, 2012. ↑ Gene Wojciechowski (April 23, 2012). "John L. Smith sports credibility issue". ESPN. Retrieved April 23, 2012. ↑ "Arkansas : Series records". mcubed.net. Retrieved 2008-05-14. ↑ "Battle for the Golden Boot – LSU vs. Arkansas". LSUsports. 2007-06-07. Retrieved 2008-01-13. ↑ "Jones to Birmingham leaves Tigers stunned". ESPN. Associated Press. 2002-11-29. Retrieved 2008-01-13. ↑ "No. 9 LSU ends No. 5 Arkansas' national title hopes". ESPN. Associated Press. 2005-11-24. Retrieved 2008-01-13. ↑ "Arkansas Game Notes vs. No. 1 LSU". Hogwired. 2007-11-23. Retrieved 2008-01-02. 1 2 3 "Arkansas Records by Team". College Football Data Warehouse. Archived from the original on December 14, 2007. Retrieved 2008-01-11. ↑ Schaeffer, Rick. Game of My Life: Memorable Stories of Razorback Football. ISBN 1-58261-988-3. ↑ Aron, Jamie. "Mallett leads Arkansas past Texas A&M 47–19." The Associated Press. Article. Retrieved 2009-10-08. ↑ Burch, Jimmy (2008-03-10). "Texas A&M-Arkansas game headed to Arlington". Fort Worth Star-Telegram. Retrieved 2008-03-10. ↑ "Texas A&M, Arkansas Establish Football Neutral Site Series in New Cowboys Stadium" (Press release). Texas A&M Athletics. March 10, 2008. Archived from the original on March 12, 2008. Retrieved 2008-03-10. ↑ "Arkansas-Texas A&M to Renew Football Rivalry at Dallas Cowboys New Stadium" (Press release). University of Arkansas Athletics. 2008-03-10. Retrieved 2008-03-10. 1 2 "Arkansas Composite Championship Listing". College Football Data Warehouse. Archived from the original on December 31, 2007. Retrieved 2008-01-11. ↑ "Darren McFadden Wins Second-Straight Doak Walker Award". Hogwired. 2007-12-06. Retrieved 2008-01-11. ↑ "Arkansas' McFadden named Walter Camp Player of the Year". CBS Sports. 2007-12-06. Retrieved 2008-01-11. ↑ "Razorback Jonathan Luigs Wins Rimington Trophy". Hogwired. 2007-12-06. Retrieved 2007-12-06. 1 2 "All-Time Outland Trophy Winners". Football Writers Association of America. Archived from the original on February 4, 2008. Retrieved 2008-01-11. ↑ "Walter Camp Football Foundation Awards". Walter Camp Football Foundation. Retrieved 2008-01-13. ↑ "All-Time Eddie Robinson Coach of the Year Winners". Football Writers Association of America. Archived from the original on January 9, 2008. Retrieved 2008-01-13. 1 2 3 Yandell, Gary. "Houston Nutt Steps Down as Razorback Football Coach". Hogwired. Retrieved 2011-01-08. ↑ "History, Honors and Letterman" (PDF). Hogwired. Retrieved 2008-01-12. ↑ Hickok, Ralph (2007-12-17). "Consensus Football All-America Teams from 1937 through 1976". HickokSports.com. Archived from the original on April 2, 2015. Retrieved 2008-01-13. ↑ Hickok, Ralph (2008-01-12). "Consensus Football All-America Teams from 1977 through 2002". Hickoksports.com. Archived from the original on December 24, 2007. Retrieved 2008-01-13. ↑ "Former Razorback Head Coach Lou Holtz Elected to College Football Hall of Fame" (Press release). Hogwired. 2008-05-02. Retrieved 2008-05-11. ↑ "College Football Hall of Fame: Wayne "The Thumper" Harris Profile". National College Foundation. Retrieved 2008-05-11. ↑ "College Football Hall of Fame: Billy Ray Smith Profile". National College Foundation. Retrieved 2008-05-11. ↑ "College Football Hall of Fame: Chuck Dicus Profile". National College Foundation. Retrieved 2008-05-11. ↑ "College Football Hall of Fame: Bowden Wyatt Profile". National College Foundation. Retrieved 2008-05-11. ↑ "College Football Hall of Fame: Lloyd Phillips Profile". National College Foundation. Archived from the original on February 22, 2015. Retrieved 2008-05-11. ↑ "College Football Hall of Fame: Lance "Bambi" Alworth Profile". National College Foundation. Retrieved 2008-05-11. ↑ "College Football Hall of Fame: Frank Broyles Profile". National College Foundation. Retrieved 2008-05-11. ↑ "College Football Hall of Fame: Francis "Close the Gates of Mercy" Schmidt Profile". National College Foundation. Retrieved 2008-05-11. ↑ "College Football Hall of Fame: Clyde "Smackover" Scott Profile". National College Foundation. Retrieved 2008-05-11. ↑ "College Football Hall of Fame: Wear Schoonover Profile". National College Foundation. Retrieved 2008-05-11. ↑ "College Football Hall of Fame: Hugo Bezdek Profile". National College Foundation. Retrieved 2008-05-11. 1 2 "Razorbacks Facilities". Archived from the original on January 22, 2008. Retrieved 2008-01-11. ↑ "Arkansas names football field after outgoing athletic director Frank Broyles". SportingNews. Associated Press. 2007-11-03. Retrieved 2008-01-11. 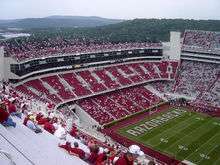 ↑ "Arkansas Razorbacks Football Schedules and Future Schedules". fbschedules.com. Retrieved 2012-11-26.